Protein powder is often referred to as an “essential” supplement for fitness fanatics who are serious about getting results. Whether you think it is or not, there’s no denying that the market is booming. According to many reports, sports nutrition sales will soar beyond $20 billion within the next four years. A large segment of that can be attributed to protein supplements. Like any other product category that takes off, the clutter begins to form. You get the good, the bad and lots of options in between. Endless options, it seems. Every company has the best product, right? But how do you know who to trust? Genetically modified ingredients are at an all-time high, there have been proven cases of untrustworthy and unethical marketing used by brands, and our foods contain more unpronounceable additives than ever. Making a choice as simple as, “What protein powder should I buy?” has actually become quite complicated. One small, simple tip could help you out. It’s definitely not the be-all-end-all for protein purchases, but it’s a step in the right direction for anyone thinking about shelling out cash. Here’s what to do. One of the first steps you can take when you’re seeking a high-quality protein product is to look at the protein ratio. All you need to do is locate two pieces of info that are readily available on the label. Once you have those two numbers, plug them into this simple equation. Example: Your product has 24 grams of protein per serving. One serving is one scoop (30g). 24 divided by 30 is 0.80, or 80 percent. This means that one serving of the product contains 80% protein. Here’s the question you must ask yourself. What is the other 20% made of? Now that you know how to figure out the protein ratio, you have to find a way to apply it. Remember, it’s just a number. It’s a factual, mathematic equation. Much of the rest is subjective, including this grading scale. In terms of protein content per serving, this chart shows how I rate each ratio and what the ratio might tell you about the product. 50-55 percent C- Find out what else is in the product to give it such a low protein ratio. It may be full of additives, artificial ingredients and substances you don’t want to consume. On the positive side, it may be that the other ingredients are useful carbohydrates or unique ingredients such as seeds, enzymes or other plant-sourced nutrients. It could also be a dedicated mass-gainer product. Just look further into the product before you make a choice. 66-70 percent B- Most mainstream protein powders are in this ratio range. Most are decent products, but there are definitely some rotten apples in this bunch. Again, find out what else is in the product if it’s not above 80 percent. A lot of times, really popular products have some appetizing flavors with ingredients you may not realize are in the product. They are definitely a step above the C-graded products, but there is much room for improvement. 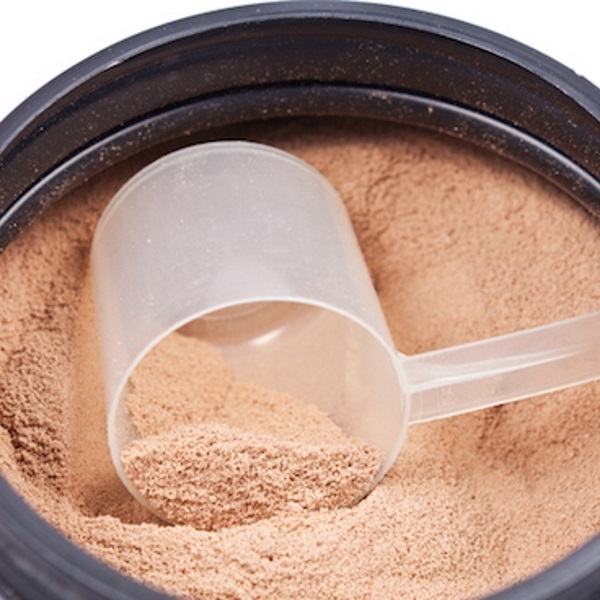 81-85 percent A- Products in this ratio range should be considered trustworthy and reliable protein powders. Although it may cost you a little bit extra, purchasing one of these products minimizes the chance that you will get poorly sourced protein. These products may even have superfood ingredients or other healthy perks. You still need to check the labels to make sure nothing slips past you, but these products are definitely moving in the right direction. 90+ percent A+ A protein powder with a 90 percent or higher protein ratio is the cream of the crop. This means there is almost nothing else in the product other than the protein source, which is ideal for most people. This product is probably sweetened naturally and has no preservatives or harmful additives. It may be on the high end price-wise, but at least you can feel confident fueling your body with a transparent protein powder. There are definitely other things to consider besides the protein ratio. What is the quality of the protein source? Where is the source from? How bioavailable is the protein? What is the amino acid profile of the product? How does the product taste? How well does the product mix with liquid? What does the consumer want to get out of the product? Those are just a few things that can be considered, and they barely scratch the surface. Is the protein manufactured up to standards that meet regulatory boards such as NSF or GMP? How well do the protein manufacturing facilities protect the product from cross contamination with potential allergens? Were the cows that made the whey raised without hormones or steroids? Is this hydrolyzed, isolated or concentrated protein? How is the protein filtered and does it alter to molecular make-up for the protein? Those are some examples of more probing questions that come to mind. Again, you may not need to know or care about any of the answers. Maybe 80% protein ratio is good enough for you and you’re sold on the product. I can respect that. Some of you may want to look deeper. I can dig that too. Whatever route you choose to go, at least you have a starting point for what to look for and why. For instance, someone who is solely interested in caloric intake might take a mass gainer product without worrying about its low protein ratio. For that person and in light of his or her goals, it may be the perfect powder. On the other hand, someone with food sensitivities or digestive issues may need an extremely pure product with few additional ingredients other than the protein source. For them, a 90 percent protein ratio or higher will probably be the right move. The protein ratio doesn’t dictate the “quality” of the product. It simply tells you how much of a serving is pure protein so you can compare and find the best product for yourself. The industry is messy, and this one article won’t clear it all up. But hopefully the information provided here can help others. I do believe that this simple tip can help everyone take steps toward deeper thinking. It’s time to look beyond marketing campaigns and make more informed decisions on what we put in our bodies. Next time you purchase a container of protein, check the ratio and then see what the protein truly has to offer. One small tweak could make a bog difference in the long run. Here are some of my favorite examples of each grade of protein ratio (A+ through B-), along with a good visual that shows how a lower grade doesn’t automatically make it a bad product. They’re all quality products. You just have to find the one that’s best suited for you.